My friend Rachel invited me to go with her to the Legion of Honor in San Francisco to view the special exhibit on fashion, High Style. Rachel is a member of quite a few of the museums in San Francisco and loves to invite her friends to go with her to different exhibits depending on who's interested in which type of art. She's allowed a free pass once a month and we, her friends, play chauffeur so everyone is happy. With my background of being a swimwear designer it was a delight to be able to view so many choice pieces of fashion that are in the Brooklyn Museum's costume collection. The exhibit is open until July 19, 2015 so there's still plenty of time to go and see it. As you probably can tell, I was quite enamored with the work of Charles James. He took a love of architecture and engineering and used it to build marvelous gowns for women. A few of the gowns had digital displays that also showed x-rays of the gowns' bones so to say. Here's one of the Tree ball gown. There's also work from Mainbocher, Madame Vionnet, Chanel, as well as other well known inspirational fashion designers. It was such a treat to see these works up close and in person. Pictures just don't do them justice. So if you have an opportunity to see it, do it! And if you have time then go to the cafe' and try their Coco Channel dish ... a yummy fresh fish ceviche with avocados. Have you ever wondered what it'd be like to work on all those amazing animated movies such as Mulan, Fantasia 2000, or The Lion King? Wonder how they come up with the myriads of Disney merchandise at Disneyland or Disney World? Want some advice for artists wanting to do the same? Well then have a listen to this episode of WDW Radio and hear the interview of Disney animator, Ron Cohee. Oh, by the way, he's not just a fantastic artist, but my brother as well. I've discovered an amazing new doll artist thanks to a tip from one of my doll lists. Lorell Lehman is an artist in South Australia who makes all sorts of faeries and woodland creatures. Her site's name says it all, "Not all faeries are beautiful" but they are indeed very striking. Go take a look and enjoy! Tuesday night at doll club, Donna showed us these fabulous Russian nesting dolls. They depict the Cinderella fairytale in a variety of beautiful colors. I loved the rich jewel colors and knew that I had to snap a picture for my inspiration file. 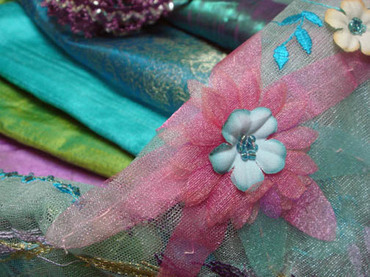 Speaking of inspiration, is anyone else attending the PIQF (Pacific International Quilt Festival) in Santa Clara? I'll be there Friday and hope to meet up with Floribunda. If anyone else plans on going tomorrow send me a quick email and perhaps we can meet up as well. My artwork is in a book! I'm so excited! I have a piece of my artwork published in a great looking book! Around Thanksgiving of last year I heard about a blogger who was looking for artwork to illustrate her essays. I can't remember how I found out about this but for some reason when I saw it, I thought that it was something that I could do. We had only ten days to get it made and sent to her. She and her publisher would go through the artwork and select one for each essay. When they saw the artwork her publisher decided to use ALL of the art! The book is called Life is a Verb by Patti Digh. It's a gorgeous book with bright colors, slick pages, and wide margins to make notes. Patti's step-father was diagnosed with cancer and died only 37 days later. This had such a profound effect on her life. What if you only had 37 days to live? What would you do? How would you live your life to the fullest so that you wouldn't die with regrets? Thus she began writing essays to leave for her two daughters. The book is a compilation of these essays and includes two different types of exercises to do at the end of each one. One is a short-term, quick exercise while the other one is designed to be done for 37 days. It's not meant to be read in one day. Rather than trying that, I've been enjoying it by just randomly opening the book and reading one essay. I highly recommend it! And of course, if you buy it, turn to page 95 and check out my digital collage artwork. Friday afternoon I spent a few hours soaking in the most amazing display of color, light and glass. The de Young Museum in San Francisco is currently hosting the Chihuly Exhibit through September 28th. WOW! There are no words to describe how spectacular this artwork is in person. Photography was allowed so I (and 90% of the other visitors) snapped picture after picture. I'm afraid that photography is not my strong suit. But I so loved the colors that I wanted to have visual reminders for inspiration. I also had fun moving the camera, trying to capture pure color and light minus the form. Go and see it! I promise that it's worth the price of admission! Luna, Angela Jarecki's travel doll from Texas, loved the glass ceiling! 1) Agnes of Feet Stamping Dolls ... she has the most innovative way to display dolls that are integral to the design .. definitely a must see. 2) Connie Ortiz of Dolls, Fairies & Other Thoughts ... another talented dollmaker. 3) Gaia of I Piccolini ... oh, this lady makes the most beautiful bears, dolls and illustrations. Her blog is written in both Italian and English and is simply delightful. 4) Linda Misa of Tact-Ilse ... you may have seen her work in magazines and she teaches online. I love the beautiful eyes on her dolls and collages. 5) Helen of Patchy Work of Mini Grey ... a quilter who shares my taste in the brighter, happier colors. 6) Natalie Hamade of Creative Characters ... dolls that would give all the showgirls in Vegas a run for their money. Check out the talent in her faces! She teaches online too. 7) Lori-Beth's project at Art For Food ... here's a woman who decided that she would use her art to make a difference in her community. Go and read all about it. I've been a fan of Angela Jarecki's art since the first time I found her Windows class online about five years ago or so. Unfortunately I didn't sign up for it in time and it hasn't been repeated until now. It's being hosted over at Doll Street Dreamers and looks like it'll be a great class. 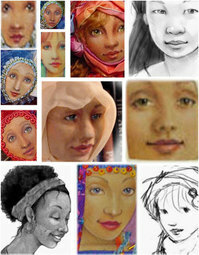 If you've been hesitant about drawing faces, Angela's the one to teach you. Just look at some of these amazing ones that she's drawn. I love that she has more than one type of look. These are realistic people of different races and ages. Can you tell that I'm excited about taking this class? Hurry, there's still time to sign up for it over here. It starts next Friday, March 21st. After you do that take a little time to check out her blog whimsymoon and her website to see examples of her art. If you think that some of them are a bit familiar looking, it may just be because she was an illustrator for Hallmark for ten years. Simply gorgeous work! My most favorite way to purchase fabrics from the Gypsy is to look around her booth until one fabric stands out at me. Well on Friday this was easy because off in the corner I spied this absolutely gorgeous tulle with 3-D flowers and embroidery. It's Spring as conveyed in fabric. Once settled on that star fabric I began to look for ones to fill the supporting roles. 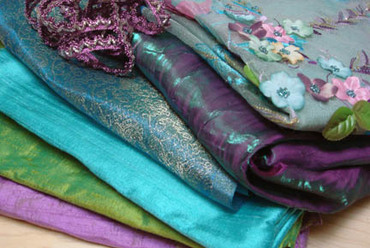 One by one we found the silks in green, aqua and lavender. It was hard trying to find a pattern fabric that wouldn't compete or conflict with the tulle but then the aqua with gold brocade jumped out. 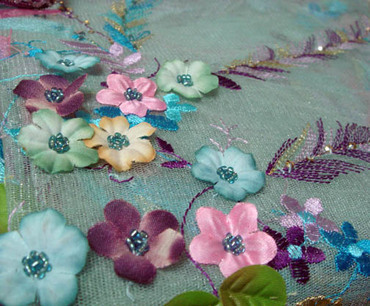 And finally Pamela suggested the purple/green fantasy fabric. Add just a touch of lavender braid and a beautiful Spring fabric story is born. Hop on over to Dawn's booth where scraps of velvet scarves, ribbons and buttons can be found and discover this glass leaf button in just the right colors. Top it off with a variety of little buttons and voila' ... the start of a fabulous new project. Of course there are others that are waiting to be finished, so this will go to the back of the line. But just the act of gathering together such a delightful mix of colors has served as a tremendous source of inspiration for my muse.